It’s that zucchini time of year. If you planted it in your garden you may already have a trickle coming in, but if not don’t fret, you will have some very soon and the trickle will turn into a flood. Zucchini plants are very prolific and sometimes leave gardeners feeling overwhelmed with the harvest and neighbors tired of all the zucchini deliveries. If your zucchini plants are threatening to stage a garden takeover, harvest the prized flowers to control production and make yourself a special treat of fried zucchini blossoms. 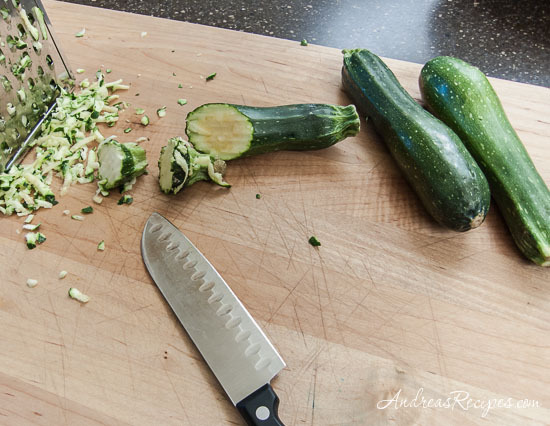 Zucchini is very versatile and can be used in both sweet and savory dishes. We like to throw it on the grill or into a pot of chili, and I have very fond memories of my mother’s batter-dipped fried zucchini, but I think my favorite way to use zucchini is to put it in bread or cakes, which is very appropriate since zucchini is technically a fruit. I think zucchini bread/cake/cupcakes/muffins must be a universal treat because I come across recipes all the time and find the basics to be remarkably similar. Take my mother’s delicious, homey zucchini bread and this wonderful recipe for Italian zucchini olive oil cake, for example. The essential ingredients are virtually identical with slight variations in amounts: flour, sugar, oil, cinnamon, walnuts, baking powder, baking soda, eggs, grated zucchini. My mother uses canola oil, the Italian cake uses extra-virgin olive oil. My mother uses slightly less leavening, and the cake uses more to achieve a bigger rise and more cake-like texture. The cake calls for ginger and nutmeg as well as cinnamon, but it’s the the lemon crunch glaze that you brush on while the cake is still hot that gives it an elegant touch. If you require more inspiration for what to do with all your zucchini or the blossoms, Kalyn’s four-part series about zucchini on Blogher should help you out. 1. CAKE: Position the rack in the center of the oven and preheat to 350º F/175º C.
2. In the medium bowl, sift together the flour, baking powder, baking soda, salt, cinnamon, ginger, and nutmeg. Set aside. 3. In the bowl of the stand mixer, beat the eggs, sugar, and olive oil together on medium speed until the mixture is light and fluffy, about 3 minutes. Scrape down the sides of the bowl, and beat in the vanilla extract. 4. Add the dry ingredients all at once and mix on low speed until thoroughly combined, then increase speed to medium and mix for 30 seconds. 5. Stir in the zucchini and walnut pieces until completely incorporated. Scrape down the sides of the bowl. 6. Pour the batter into the prepared Bundt pan and smooth the top with a spatula. 7. Bake for 45 to 50 minutes. Rotate the cake halfway through baking to ensure even browning. Tester should come out clean and the cake edges should start to pull away from the sides of the pan. 8. GLAZE: Make the glaze while the cake is baking. In a medium bowl, whisk the lemon juice and granulated sugar, then whisk in the confectioners sugar until the glaze is smooth. Strain any lumps as necessary. 9. Remove the baked cake from the oven and allow to cool in the pan for 10 minutes. Place the wire rack over a piece of wax paper and invert the cake onto the rack. Use a pastry brush to brush the glaze all over the hot cake. It will stick to the cake and set as the cake cools, leaving a nice crunchy surface. Allow the cake to cool completely and the glaze to dry completely. OPTIONAL: You may dust the cake with confections sugar before serving. 10. Wrap cake in plastic to store and use within 2 days. I think you’re right that zucchini bread and cake is a universally loved treat. Looks delicious. Thanks for pointing people to my BlogHer series too! Hi Andrea,this is my first visit to your blog,this is a very good recipe……will definitely try this one……..
Kalyn, I think that series is great! MyKitchenInHalfCups, I’m with you! Bring on the zucchini! This cake must be delicious! Your cake looks fantastic! I am anxiously awaiting zucchini from the organic garden I joined (I should be careful what I wish for, right?) and this cake is at the top of my list of things to make! Now that’s a zucchini cake worth getting excited over! And I didn’t realize zucchini was a fruit. Thanks for that, Andrea! Monica, we thought it was delicious! T.W. I wish you lots and lots of zucchini! Susan, I’m looking forward to meeting you, too! Andrea – this is one of the best cakes I’ve ever made. i added cardamom bc that is my fave, and the cake – with the lemon glaze – is just superb. i am on my 3rd piece. we made it this morning. YAHOO! Thanks! This cake is so delicious! Recipe was easy to follow. 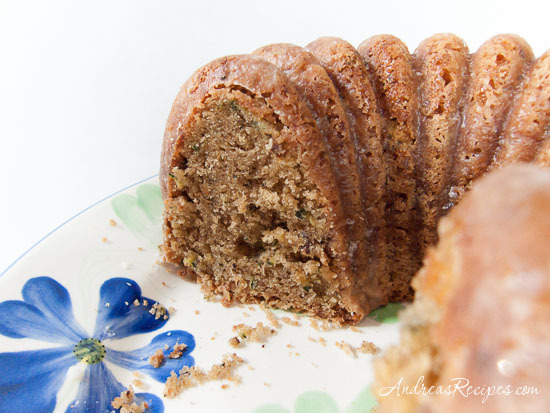 The cake is light, moist and the flavors are fantastic. Will make it over & over! Can you make this cake without the walnuts?! My daughter has a nut allergy! Hi Vicki. Yes, you can omit the nuts.